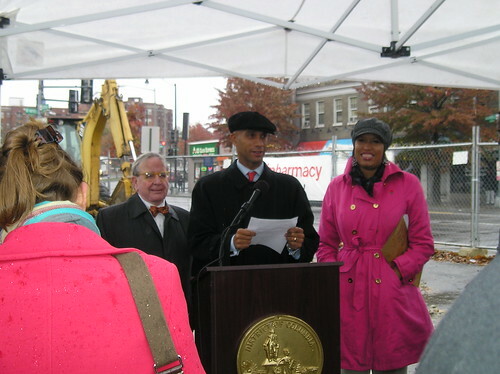 CVS Breaks Ground | Park View, D.C. 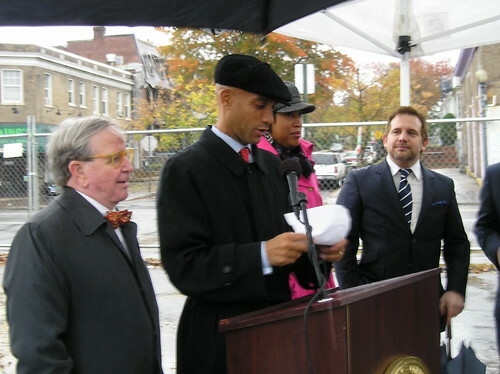 Starting shortly before 11 a.m. this morning, Mayor Fenty, Council members Graham and Bowser, developer Rob LaKritz, representatives from CVS and other ANC and city officials met at the corner of Georgia and New Hampshire Avenues to official break ground for the new CVS. 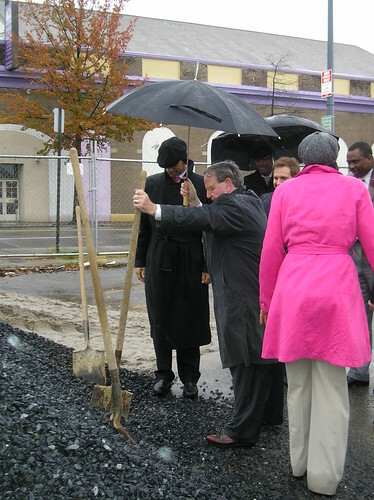 The project is estimated to be completed by late spring/early summer of 2010. This project was a long time coming and the best possible outcome for the property. The last business to be located there had been a gas station, and when development was first planned a gas station was once again proposed. Through the efforts of many, and the commitment of LaKritz working with Graham, Fenty, and others, a much-needed CVS is being constructed on the site instead. Today we broke ground on another new development in Ward One – CVS Pharmacy at Georgia and Princeton. This one will service our neighbors in Park View on Georgia Avenue. This is a wonderful achievement for us. It took four years to come up with just the right project – from a gas station (which we rejected) to an ice cream store to a doughnut shop. But now with the new Senior Wellness Center coming, a pharmacy is just what the doctor ordered. CVS is scheduled to open in May or June of 2010. Our seniors won’t have to go far to get their checkups and prescriptions. And new residents at Park-Morton and all around Park View can get a little shopping done on the way too and from work. Oh, I forgot to mention, this entire project was significantly helped by $2 million in city money to remediate the site. And a little help from me from my Metro Board seat. We included land previously owned by Metro to complete the CVS parcel. This newest development joins the Senior Wellness Center, new mixed retail/residential at 3512 Georgia Ave. and a New Community for Park-Morton. We are really on the move on Georgia Avenue! This entry was posted on November 12, 2009 at 11:42 am and is filed under Development, Retail. You can subscribe via RSS 2.0 feed to this post's comments. Should have been more dense development right across from the metro station — this is a missed opportunity. What would be great: clerks that are effecient and polite, something I have never encountered in ANY DC CVS.